I broke a record yesterday: my PTM count. At this point last year, I hadn’t been on the mill at all. In fact, at this point last year, it had been more than a few years since I was on one. Last winter, as I learned to be more determined about getting in my weekly mileage, I found myself running the ‘mill twice: once in February and, again, in March. Yesterday, I surpassed my personal treadmill count; This year alone, I have been on the treadmill three times! Obviously, I’m not a fan of running on the machine. When someone mentions their workout on one, I cringe. Ironically, I do admire those, though, who have the dedication to get on it day after day, or for longer runs. Me? I’ll spin on a bike quite comfortably but I struggle to run a treadmill workout. Like everyone else in Ontario, I have had a tough time dealing with this winter’s cold, wind and ice. I clearly remember thinking we were in a “January cold” in December, and it has only gotten worse. Thursday night, with a long run scheduled on a night with what has become typical extreme cold temperatures, I opted to wait until Friday; at least, I’d have daylight. But yesterday, as I started to pull on my layers in the late afternoon, I suddenly changed my mind about heading outside. Going to the Rec Centre made much more sense. 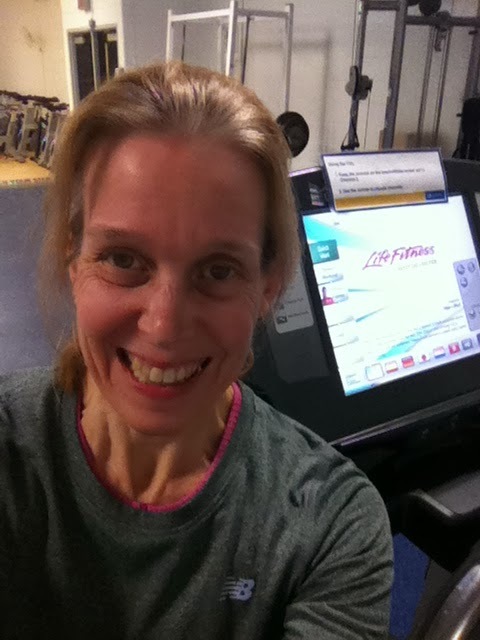 Fortunately, being Friday night, the Fitness Centre was quiet and I was able to run for 80 minutes. While on the treadmill, I decided it was time to change my attitude and accept the good things about it. 1. Less laundry. I know it’s strange that this is first on my list, but I’m tired of the loads of wash that winter running brings. On the treadmill, I only need one layer instead of 3 or 4. 2. Form: Focus on form, focus on form, focus on form. On my second treadmill run this year, I found myself stuck in front of a mirror the entire time, which meant I was also stuck staring at myself the entire time. I noticed that my left elbow sticks out a bit when I run – something that I wouldn’t notice on the road. Yesterday, I tried to focus on bringing my elbow closer to my body (or I could keep things the same so that I can elbow the competition at my next race). 3. Pace: With the exception of warming up, I held my pace the entire time – a little slower than my marathon pace. 4. Mental power: Running on the treadmill is mind-numbing. The 80 minutes I spent yesterday has to be some kind of Jedi mental training to help prep for the marathon. Somehow, I have a feeling that I’m going to be facing the treadmill again in the near future; it’s just been that kind of a winter. And I’m ready for it.